Francis (Frank) Caswell was the son of Mark and Ellen Caswell. He attended St Andrews, Springbrook, Albury and Fairlie schools. Francis, also known as Frank, was born at Timaru on 17 October 1887, one of 17 children of Mark (1845-1933) and Ellen (1854-1938 nee Fletcher) Caswell. His parents farmed at Holme Farm Albury, and prior to that, had farmed in the Springbrook district south of Timaru. He was educated at the Timaru South, St Andrews, Springbank and Fairlie schools and was a keen rugby player in his younger days. Francis was aged 28 when he enlisted on 19 October 1915, and working as a stockman for Mr Smith in Hawke’s Bay. He gave his last address as Stortford Lodge Hastings, and nominated his father Mark, of Albury South Canterbury, as his next of kin. He was described as being 5 foot 7 inches tall, weighing 11 stone 4 pounds, single, Anglican, of fair complexion, with brown hair, blue eyes, a chest measuring 35-38 ½ inches and having fair teeth. 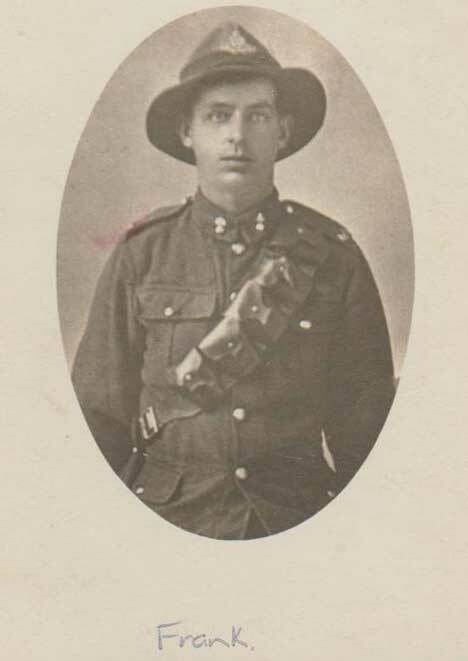 Posted to the Wellington Mounted Rifles, he left Wellington on 14 January 1916 with the 9th Reinforcements aboard the SS Dalmore, a horse transporter, bound for Suez Egypt, arriving at Alexandria on 26 February 1916. Three days after arriving in Egypt Francis was transferred to Number 8 Battery NZ Field Artillery, and left with them for France early April 1916. His unit was to be involved in all the major battles on the Western Front. Some relief came in 1917 when, from 14 to 27 February, he was granted leave in the UK. Leave was again granted from 29 January to 13 February 1918. Following this later leave, he was detached to the Artillery School on 24 February, followed by a transfer to the 3rd Brigade NZ Field Artillery on 22 March where he was posted to Brigade Headquarters. He was again on leave in UK from 12 to 29 January 1919, where he was to remain at the Artillery School until boarding the SS Briton at Tilbury on 24 July, for his return to NZ. During this time he married Miss Mary Jane MacPherson (1889-1961), youngest daughter of Charles MacPherson of Crathie, Laggan, at St Anne’s Church at Corstorphine on 26 March 1919. The marriage ceremony was performed by the Reverend J. Robertson BA. After having completed a total of 3 years and 307 days service, Francis was discharged in New Zealand on 21 August 1919, and was later awarded the British War Medal and Victory Medal. Francis was employed as a farm labourer for the rest of his working life. 1919 Found him back in Albury working for Mr F.H. Smith. Mary would have come out later as a war bride and by 1928, they were both at Camp Valley, Albury. By 1935 they were residing in Fairlie where Francis retired in 1963. On 16 October 1976, Francis died at Timaru and was buried with his wife Mary (who had died on 14 April 1961) in the Timaru Cemetery. Five of Francis’s brothers also enlisted in the war. Private William Caswell (no. 17/382), NZ Veterinary Corps, was killed in action on 23 June 1917 and is listed on the Messines Ridge (New Zealand) Memorial, Messines Ridge British Cemetery, Belgium. Private George Caswell (no.6/4008), Canterbury Infantry Regiment, was killed in action 21 September 1916 and is buried in the Caterpillar Valley Cemetery, Longueval, France. Driver Alfred John Caswell (no. 50580) served with the NZ Army Service Corps. Trooper Henry Caswell (no. 7/29) served with the Canterbury Mounted Rifles, and Trooper James Walter Caswell (no. 17/380) also served with the NZ Veterinary Corps.